In Photo(L-R) Jaybee Garganera-National Coordinator, Alyansa Tigil Mina; Atty. Aaron Pedrosa, Secretary General of SANLAKAS; Marcial Mooc, Chairperson, SAMAMO/PROMISI; Atty. Gerthie Anda, Director of Environmental Legal Assistance Center; Angelica Dacanay, Advocacy Officer of Bantay Kalikasan; Victoriano Colili, Local Community Representative; Herman Malong, Fishpond Owner/Operator; and Dr. Ben Molino, CCOS Chairperson. 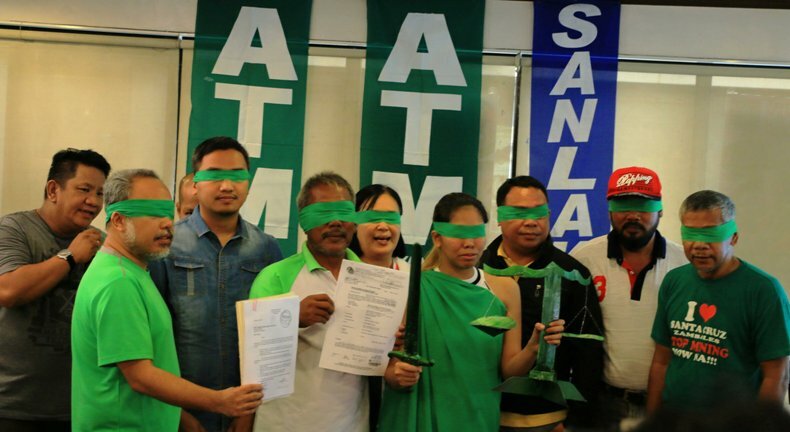 QUEZON CITY – The Environment Day turned into a call for green justice among environmental groups and seek courts to stop mining projects in four different provinces. The environmentalists called on Duterte Administration for green justice to penalize liable people in the government who issued permits and violations caused by mining. Palawan, Nueva Vizcaya, Eastern Samar, and Zambales are among the provinces with mining operations. “Mahalaga na mapanagot natin yung mga pamahalaang local at iba pang opisyales ng gobyerno na pinayagan yung pagmimina, at ngayon nalalagay na sa panganib at kahirapan yung ating mga mamamayan”, said Atty. Gerthie Anda, Director of Environmental Legal Assistance Center. Meanwhile, Atty. Aaron Pedrosa of SANLAKAS stated that “change is coming” when the Duterte Administration would make a certain action to cease the mining operations in different provinces. Pedrosa and other volunteer lawyers have filed several cases in an attempt to halt the mining operations in Nueva Vizcaya, Palawan, Iba, Zambales, and Eastern Samar. The outcry of concerned citizens from the latter during the press conference was a slap to the miners which apart from the health risks brought about by mining to the communities, livelihood and agriculture are also affected. The National Coordinator of Alyansa Tigil Mina Jaybee Garganera also asserted that mining cannot uplift the economic status of the country, and is harmful to the environment, and to the citizens, too. Final decisions on various petitions and cases are still pending.